Despite being mostly employed as a woodworker since the age of 15, and searching on the internet for clarification, I am unable to answer the following question: What, if any, is the difference between a veneer pin and a headed brad? Is veneer pin perhaps a British term for wire gauge headed brads? Although my D/G Erica is still an ongoing project I took it to a session last night and was told that my playing was coming on well - I suspect that my ability to keep up with the pace set is entirely down to the fettling videos. It is so much more airtight and I've got the keyboard almost perfect. Almost everything and a bit more will be needed for my next project. Refacing the pallets is the most urgent as there is a residue of moulting felt surrounding the pallet mechanisms. And regasketing the bellows will improve its box asthma. That there is a big box. Three voice MMM most likely although LMM is possible. 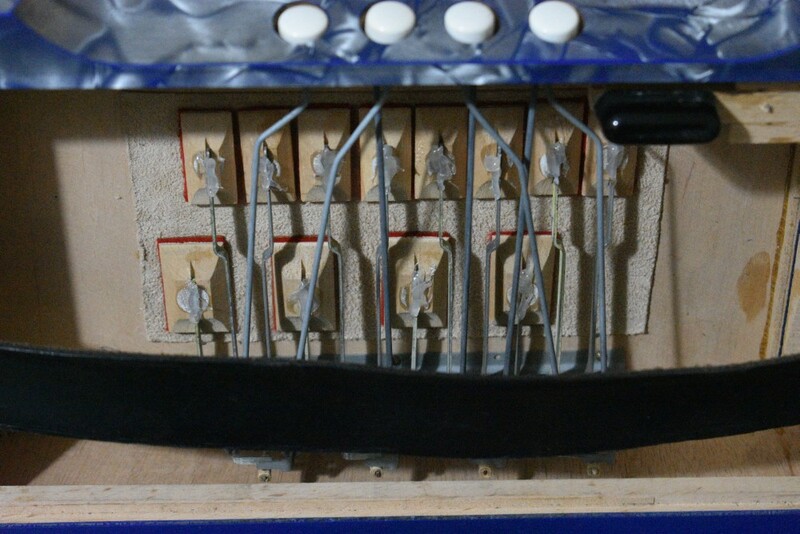 Refacing pallets on the bass end may take a while or be too daunting to attempt as the complex mechanism that allows reed sharing for the chords make it impossible (in my estimation) to access the pallets without removing the mechanism en masse. I seem to remember looking at it once and wondering if I might remove the stradella type links one by one into a holding rack in the right order. If you do have a go please take pictures and document your methodology, that would be very useful. Good luck. It's LMM Pete. The tremolo and low reeds can be switched out. H reeds apart from T reeds on the bass notes only. The treble pallets fall apart as I play it, but it sounds fantastic. And LOUD. The bass seems not too bad so that might not be urgent. I have a club IIB too. A grey Darth but in worse condition. That might be for the chop though I'm quite fond of the Darth look. I can't do a series like Lester, but I'll do photos and try and do it in sensible stages. Bass will stay club, but I can't cope with the gleichton. Not at this stage. My Club IIB Victoria has a sharing mechanism and it was quite easy to reach the pallets, the big issue was gluing the half-row pallets on the treble side. If the club IIIB is similar, then it shouldn't be a problem. The Club IIIB is nothing like the Victoria Eshed, I'll take a pic when I get a chance. How many reeds per chord/bass does it have that such a contraption is necessary? I'll take the bass end off and take a pic of the reed blocks later this evening or tomorrow. Just in case anybody knows, what size gasket do I need for the bellows on this club IIIBS and is it the same for a club IIB (Darth Vader type)?